May 22, 1999, L. G. Crabo. 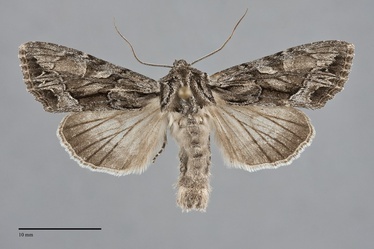 Apamea spaldingi is a medium-sized to large moth (FW length 16–20 mm) with a streaky gray forewing with a pattern that includes a black median dash and strong W-mark along the outer margin and a two-toned hindwing that flies in steppe during the spring. The ground color is mottled medium-dark and light ash gray without warm tints, darker in the median area except near vein CuA2 and beyond the reniform spot, in the costal and mid-subterminal area, and in the terminal area except at the apex which is light. Black basal and median dashes are present, with a similar mark along the posterior margin basal to the antemedial line in many specimens. The distal veins are dark. The transverse lines are variable gray to black, often with strongest black components abutting to the median area and gray elsewhere, filled with light gray to nearly white in the postmedial line in the fold. The basal line is usually absent. The antemedial line is excurved with apex in the fold, drawn inward on the veins and strongly incurved on the posterior margin. The median line is gray, diffuse, variable from absent to strong, bent nearly 90° below the reniform spot when present. The postmedial line is scalloped, angular with bends below the costa, on M2, and CuA2, strongly angled toward the outer margin from the costa to M2 and increasingly angled toward the base at subsequent bends. The segment in the fold is prominently black and white. The subterminal line is pale gray, weak except on the mid-wing where it forms a strongly pointed W-mark to the margin on veins M3 and CuA1. It is preceded by strong black wedges near this mark. The terminal line is a series of black lunules or triangles. The fringe is checkered light and dark gray. The orbicular is an elongate oval or bar, strongly outlined in gray to black on the anterior and posterior sides and filled with light gray peripherally and a darker gray central line. The reniform spot is kidney shaped, most strongly outlined medially, filled with light gray and a darker gray spot at the lower end. The claviform spot is absent or a gray smudge above the black dash. The hindwing is pale tan-gray with a distinct dark marginal band. Gray discal spot, veins, variable postmedial line, and terminal line are also present. The hindwing fringe is white with a yellow and gray base. The head and thorax are gray and tan-gray with black lines across the mid-collar and near the edges of the tegulae. The male antenna is bead-like. This species can be identified by its early flight season, streaky gray forewing, and light hindwing with a distinct marginal band. Similar species such as Apamea cinefacta and Apamea commoda have a darker hindwing without a distinct marginal band. This species is slightly variable in our region. Populations from the Siskiyou Mountains of southwestern Oregon have a dark blackish gray median area. This species is widely distributed in dry forest and rangeland habitats throughout much of western North America. In the Pacific Northwest, it is common in dry open ponderosa pine forests, juniper woodlands, and on open sagebrush steppe at middle to low elevations east of the Cascades. It occurs in open pine forest on serpentine barrens in the Siskiyou Mountains. 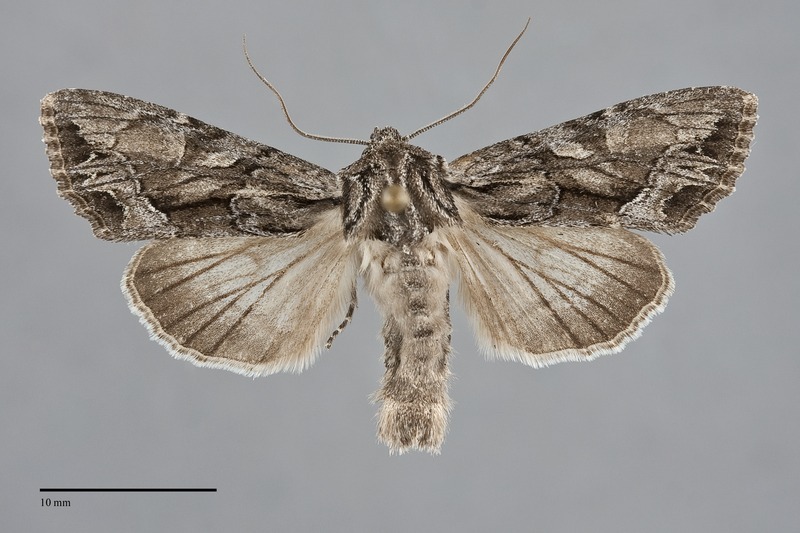 Apamea spaldingi is found in the dry interior of our region as far north as south-central British Columbia. It is common in the Columbia Basin, southeastern Oregon, and southern Idaho. This species has been found in grasslands the Willamette Valley and Siskiyou Mountains west of the Cascade Mountains. This species is widespread in the West from the western Great Plains to the dry interior of our region and eastern and southern California. The eastern limit of its range is near a line coinciding with the eastern borders of states from Montana to New Mexico. No information is presently available regarding the larval biology of this species, but it is probably a soil-surface feeding cutworm that feeds on short bunchgrasses (Poaceae) based upon the habitat. 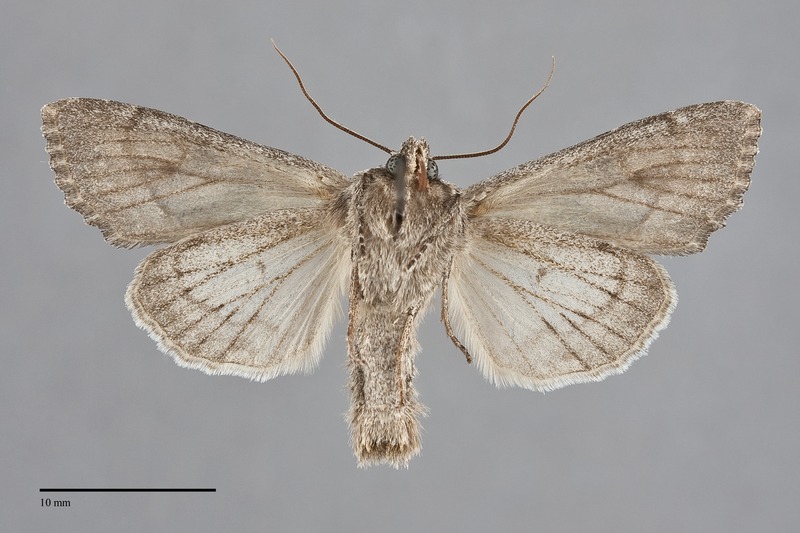 The flight season of A. spaldingi is early for the genus, beginning in late April and peaking during May. A few stragglers have been collected as late as July. It is nocturnal and comes to lights.